have been released by Active Endpoints, Adobe, BEA, IBM, Oracle and SAP on Monday, 25. June 2007. Consequently some syntax and interface proposal as listed on this site became obsolete that we want to integrate with the syntax via conceptional meta-models. The need for integration of human interaction scenarios into BPEL processes lead to the formalisation of tasks and human roles. The specifications BPEL4People and WS- HumanTask introduce, among other definitions, a dedicated people activity that uses a task performed by a human as well as human roles that describe the relationship of people, processes and tasks. 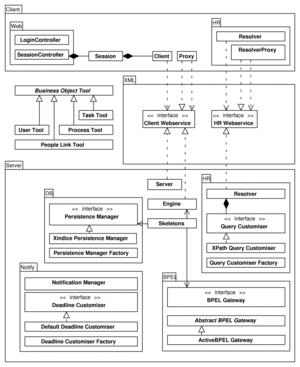 This work presents the architecture of Vienna BPEL for People (VieBOP), a new BPEL4People system that can be coupled with an arbitrary BPEL engine. We evaluate the standards for BPEL4People and WS- HumanTask against goals as derived from the BPEL4People white paper and compare it to our work. Web services have become widely accepted as the de-facto standard for distributed business applications. They bring maximum interoperability, use an open and flexible architecture, and the implementation and complexity of a Web service can be hidden towards a service requestor. Layered on top of these services, BPEL, the standard for Web service orchestration, formally describes processes. While external activities correspond to Web services, human interactions and process activities that are related to human aspects cannot be specified using plain BPEL. Thus, while BPEL glues together the logic of a process, individual solutions have to be realised when people are integrated into business processes. Thus: there is a need to integrate people into BPEL processes. by extending BPEL with additional independent syntax and semantic. have been published by various companies. As BPEL4People really is an extension to BPEL, we chose to design a system that interacts with arbitrary BPEL engines while hosting BPEL4People information and managing BPEL processes on a people level. VieBOP thus encapsulates a traditional BPEL compliant engine transparently while offering specific interfaces to clients. We can accomplish that by replacing BPEL extended elements into a set of invoke and receive activities for deployment on the BPEL engine. As with the people activity, the extension, that is hosted on VieBOP, then is transparently called by the BPEL engine.